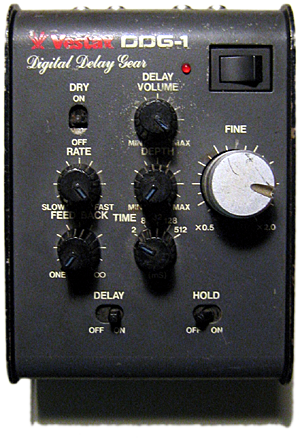 A friend working in a DJ equipment store in Berlin around 1997 recommended buying a preproduction delay unit by Vestax called DDG-1. Soon after I regretted i hadn’t already gotten two of them, as this one got to be a permanent companion right away. Unfortunately it never got into a full production then, CE certificate issues, i heard. 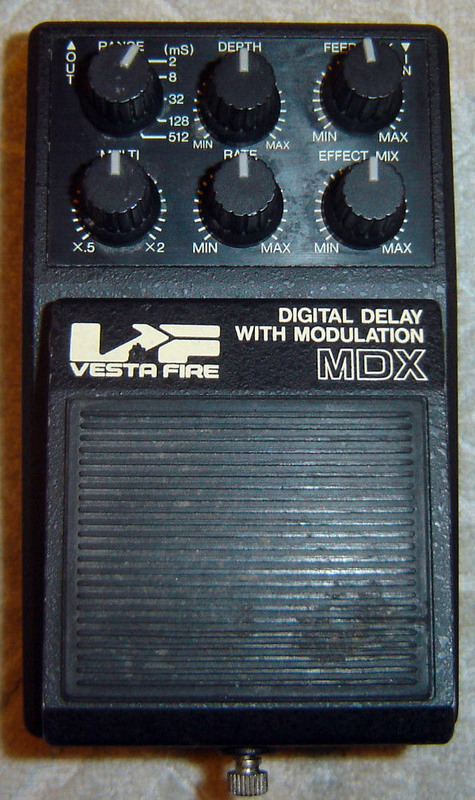 A non-existing delay unit. So here’s a Vestax DDG-1. This table unit has a unique combination of features in one unit, which i couldn’t find anywhere after. - It has a hold switch, to loop data in delay buffer. - It has delay time modulation with depth and speed (approx. 0.05 Hz to 10Hz), capable of extreme sounds, working both in delay and hold mode. LFO waveform is roughly a sawtooth. - It has 5 delay ranges, 2, 8, 32, 128 and 512 ms, all variable with a separate dial 0.5x – 2x. When you switch the range, old audio remains in buffer until overwritten. Good for interesting hold loops. - Big silver delay time knob and LFO give you pitch control as clean as on a tape machine. That small loop starting to pitch there and going on with various alterations. A Vestax MDD-9 is mono, but has nice extra output and remote control options. Beware, it runs on 15V. 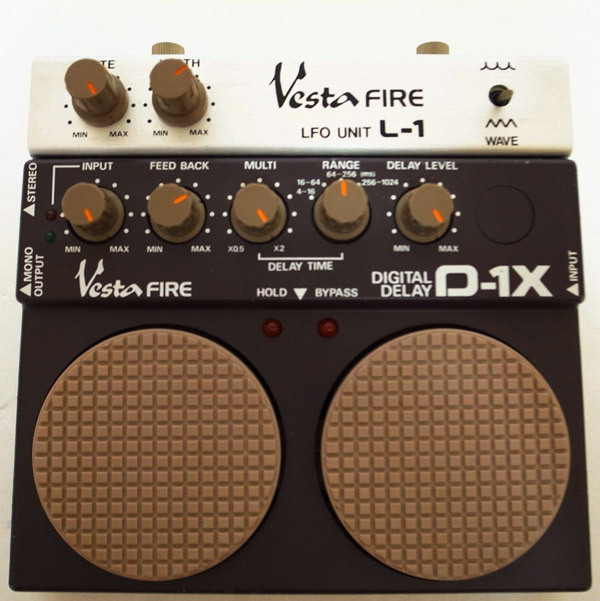 A Vesta Fire D-1x with additional LFO unit, stompbox-style. This one lacks the 2 ms range of the DDG-1. The hold function only works in 256-1024 mode – but the LFO unit has two switchable waveforms. My unit arrived with a broken LFO unit, i am still repairing. Unfortunately the D-1x has no option to listen to delay only. As a foot pedal it is yet great. It self-oscillates to a greater extent, than the DDG-1 and it’s overall sound is very analog. Recommended unit for compressed signal, input needs a good minimum level to escape the noise floor of the unit. Youtube video, not from me. Finally the ideal variation, unfortunately without hold switch. Vesta Fire MDX. Thank you to the Looper’s Delight mailing list for helping research all those options. If there’s anything similar i haven’t covered: Please comment. Thank you. I’ve inherited a non-working MDX from my brother. Do you know of anyone who might have a schematic to help me bring it back to life? Chris, that’s awesome! Can’t wait. My uncle has a boxed, unused Vestax DDG-1 that he keeps asking me to sell for him! Let me know if it would be of interest and I’ll find out how much he wants for it (haven’t been able to find a guide price anywhere, but I see this is a fairly rare bit of kit!). I have photos I can send you straight away if you want to take a look. Cheers.